Ford has unveiled the all-new Fiesta ST ahead of its official launch at the Geneva Motor Show and, if you’re a fast Ford fan, you can be safe in the knowledge that the new car is lighter and more powerful than ever before. Powered by an all-new 200 PS, 1.5-litre EcoBoost engine, the third generation Fiesta ST will be the first Ford performance model ever powered by a three-cylinder engine. 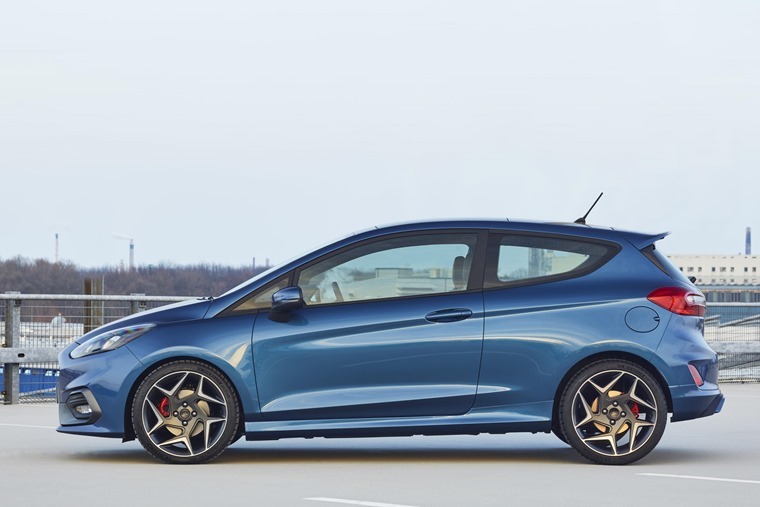 The model will also feature be the first Fiesta ST to feature selectable Drive Modes – enabling engine, steering, stability controls and even exhaust sound to be adjusted for optimised driving fun in any scenario. 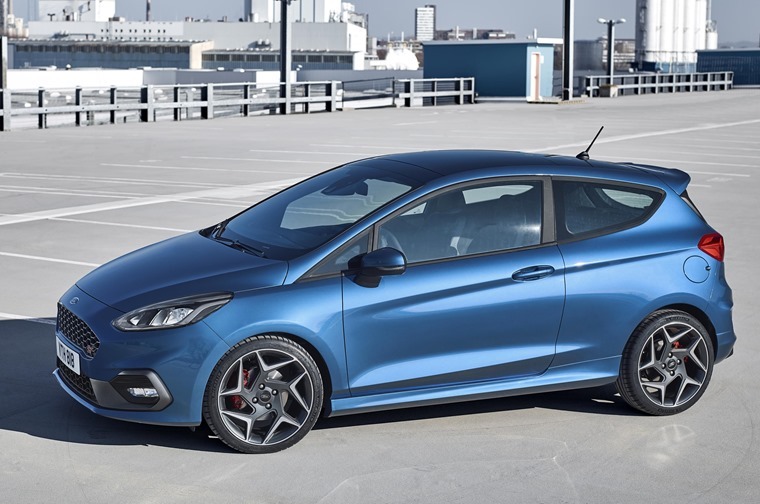 Externally, the new ST is based on the upcoming generation of the ubiquitous Fiesta, but unlike more sedate models, there’s flared wheel arches, beefier bumpers and of course a trademark spoiler; you’re left in no doubt that this is the fastest Fiesta out there. 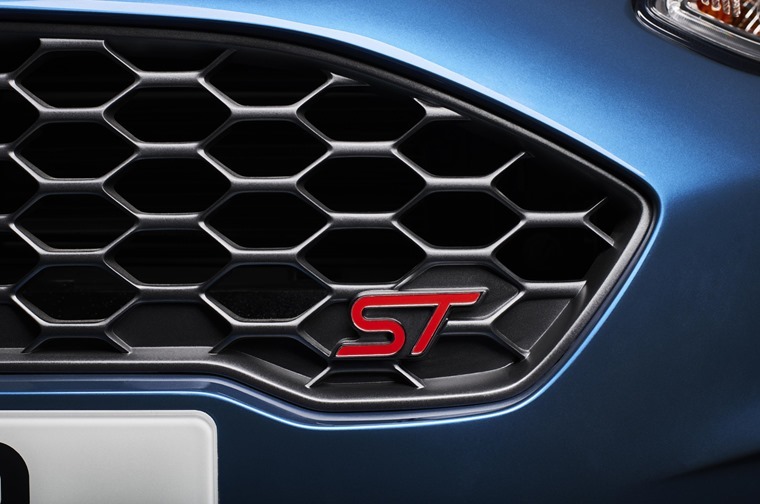 Available from launch in early 2018 in both three-door and five-door bodystyles, the next generation Fiesta ST will be offered with a greater variety of interior trim and personalisation options than ever before, with bold and distinctive exterior styling that includes a unique race-car-inspired mesh grille and exclusive 18-inch alloy wheels. 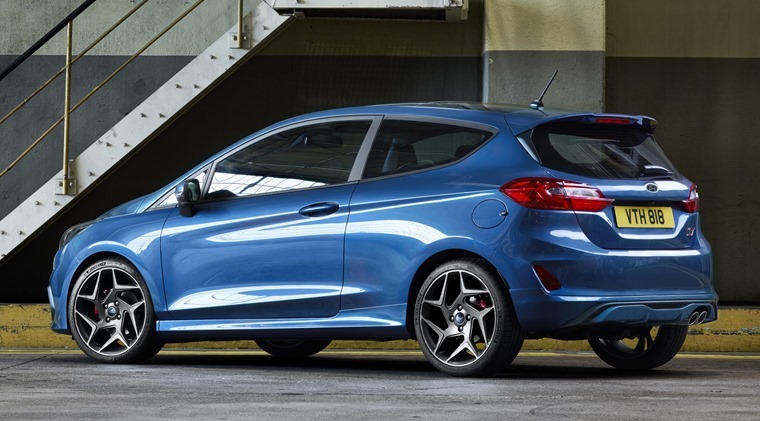 While the overall look is rather similar to the sporty looking (but less powerful) ST-Line model, it still stands out thanks to unique 18in alloy wheels and those larger bumpers. On the inside, Ford says there will be more individual styling packs on the cards, with several new trims and upholsteries available. 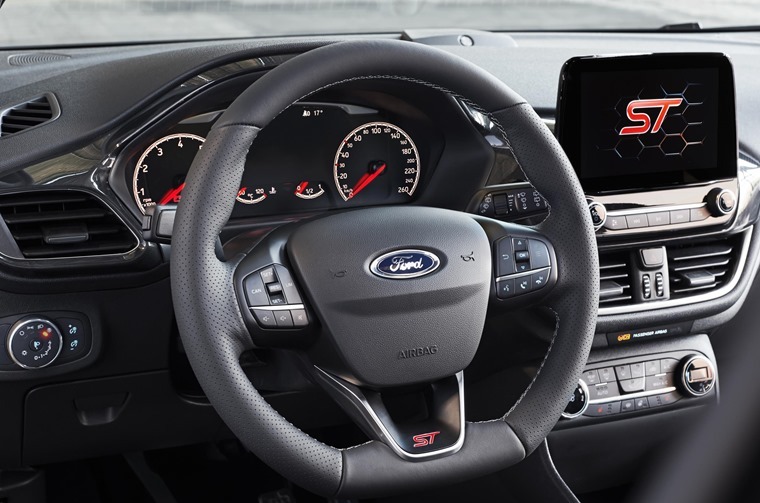 All STs will come with Ford’s Sync 3 infotainment system that comes complete with an 8in touchscreen, while the sporty Recaro seats and leather-bound sports steering wheel remind you you’re in something a cut above the standard car. The most significant upgrade however, is under the bonnet, where the outgoing car’s 1.6-litre turbocharged four-cylinder unit has been completely replaced with a new 1.5-litre three-cylinder EcoBoost engine. With 197bhp on offer, it produces 17bhp more than the current ST, while torque is up from 240Nm to 290Nm, too. This results in a 0-62mph run of 6.7 seconds and a top speed of around 140mph. One less cylinder and less cubic capacity also means that we can expect a reduction in emissions, with the EcoBoost producing as little as 114g/km of CO2. While exhaust fumes may be down, we can expect fuel economy to go up too, although Ford is yet to release official mpg stats. This is all thanks to the all-new 1.5-litre EcoBoost engine which uses technology including turbocharging, high-pressure fuel injection and Twin-independent Variable Cam Timing to deliver optimised performance and fuel efficiency. The engine’s three-cylinder architecture delivers naturally high torque at low rpm with performance further boosted by a new turbocharger to build boost pressure faster and minimise lag for a more responsive and fun driving experience. With the current car offering sublime handling, there was little want for Ford to change the chassis or suspension set-ups. However, Ford has updated the car’s Torque Vectoring Control to make individual wheel braking faster, while the traction control system has been tweaked too. No list or lease prices are available yet, and that’s because the ST won’t be hitting the road until early 2018, a few months later than the rest of the range. If you can’t wait until then though, you can check out great lease deals on the current ST here.